Palm reading has been around for hundreds of years, and it is probably more popular now than ever before. The basic concept behind palm reading is that the various characteristics of your hands, such as your palms and fingers, have meanings related to you and who you are. Although some people may not believe in palm reading, others find that the palm reading can reveal truths about themselves and their future. 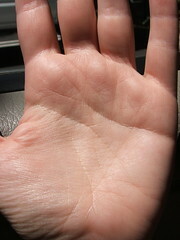 One of the most popular and prominent lines in palm reading is the heart line. Read on to learn more about the heart line and how to read your own heart line. What can you learn about your heart line? The heart line is one of the four major lines of your palm, the other three are the head, life, and fate lines. In most cases, the heart line is the very first line that is analyzed by palm readers. The heart line is normally oriented at the top half of the palm, and it is usually the most prominent line running horizontally from under your smallest finger toward your index finger and middle finger. Your heart line reveals information about the balance between your emotions and intellect, sensitivity and stoicism. Also, this line can reveal information about your capacity for relationships and the tendencies that you may have when it comes to relationships (i.e., inclination for Karmic relationships, divorces, or dependency on your partner). 1. The first step is to take time to learn about palm reading, most especially about the significance of the heart line. You can learn in actual palm reading classes, through the Internet, books, or apprenticeship. 2. Next, it is essential to understand what the different characteristics of the heart line reveal about the person. Also, it would be best to learn how the heart line relates to the other lines on the palm and fingers. 3. Practice what you have learned by examining your palm. Try to make the connection between your actual personality, character, and qualities so you can get a deeper understanding of what the heart line can reveal about you. 4. Finally, hone your skills by practicing on different people. As you gain experience and practice you will find that you will be able to delve even deeper into palm reading, its meaning, and its effectiveness. Line length – Those with long heart lines extending to the end of the palm are normally more emotional and are more inclined to look for monogamy, “true love,” and someone to depend on. Short lines, on the other hand, are a sign of self-centeredness. Those with short lines are usually more concerned with the physical aspects of relationships rather than the emotional. Line position – If the position of the line is closer to the index finger, this means that you are generous, giving, dedicated, and caring. If the position of the line tapers more toward the middle finger, this means that you are more demanding, attention-seeking, and that you have high expectations from your partner. To read the heart line, you will have to examine the length, depth, continuity, size, curve, and position of the line in relation with the other features of your palm. The two descriptions above on line length and position are just basic readings. There are more to learn, if you take time and you dedicate yourself to learning palm reading. Also known as Palmistry or Chirology in other lands, Palm Reading has been with us for hundreds if not thousand of years. Many astronomers claim to predict your fortune by looking at the lines of your palms, claiming that the lines affect the course of your life and whether you are lucky in any plans you intend to pursue. Most often than not, your left palm and right palm have different lines and Astronomers claim that it was built that way and each hand contradicts the other, occasionally naming the left palm as Yin and the right palm as Yang and that gender also influences the lines on the palms. Though science has yet to prove whether this is true or not, a little palm reading and a news of good fortune wouldn’t hurt, right?